Deep, Backward, and Square: Think about it, and then... field? "I am careful, when I am organising school cricket, to train a scorer, from the ranks of the unathletic but scholarly, who will show enough interest in the game, as well as in his tea, to be used in 'away' matches. I prefer one who is both a mathematician and a boy of firm character, with a fondness for washing and good table manners." GD Martineau. The field is full of shades. 1946. Think about it, and then... field? This isn't really a stats post; I just thought it was an opportune moment to draw attention to something which surprisingly few cricket-watchers appreciate: that teams are more likely to win test matches – and less likely to lose them – if they bat second. This has not always been the case, but it has been consistently true for a few decades, now. Since the beginning of 1980, 333 tests have been won by sides batting first; 383 by those having second dig. In other words, the team batting second has been about 15% more likely to win. This phenomenon is shown even more clearly if we cast the net wide enough to encompass all first-class cricket. Since about 1960, somewhere in the region of 25% of games have been won by teams batting first; for those who fielded first-up, that figure rises to around 30%. I should be clear that there is absolutely nothing original about these observations: some of the more competent cricket statisticians – Charles Davis in the vanguard – have been banging on about it for years. The reason I raise it is that I think the recent test series between South Africa and England provides a really neat illustration of one of the key reasons why this should be, and why it might be worth questioning the bias towards batting first that still prevails amongst captains winning the toss. Above all, it is conspicuous that, in all four tests, the side who batted first failed to win, and the side who fielded first got the result they wanted out of the last day. Famously, in both the first and third tests of the series, England clutched draws from the jaws of defeat; in both instances, they had lost nine fourth-innings wickets, and South Africa were left rueing their failure to claim that last scalp. Another feature shared by these two tests was that South Africa had declared their second innings, Graeme Smith judging the target to set England and, more importantly, the amount of time his bowlers would need to dismiss them. In each case, the tourists got nowhere near their nominal target: they were 135 runs short at Centurion and 169 behind when time ran out in Cape Town. This is important; it turns out that – had he known in advance exactly how many England would score – Smith could have declared much earlier and, surely, his bowlers would not have needed much additional time before they would have claimed that elusive last wicket. Ultimately, South Africa had excess runs up their sleeve – runs they didn't need, runs that they had spent time accumulating. Well, maybe if Smith were an astonishingly prescient captain, he could have set England what might have looked like generous targets, and all would have been well for him. I didn't see him get much criticism for delaying his declarations in post-match coverage, and I'm sure that's fair enough: it would have been difficult to predict events as they transpired, and I certainly wouldn't want to undermine the praise that Graham Onions and rearguard cohorts rightly received for their efforts. It's worth emphasising, though, that – monstrous first-innings leads aside – these decisions are never faced by the side batting second. There is never a question of excess runs for them: to win the match, they have to score just one more than their opponents amassed. As a thought experiment (I know there are good reasons to object to this, but go with it for now), imagine that everything had been the same in those two tests, but with the order of innings reversed. So we have England's sub-par first innings followed by a decent score from the hosts and, then, England batting third scraping together a dogged 200-and-some. Let's be generous to the last pair, and say they would have lasted an additional 10 overs, and scored 25 runs in the process. As a result, at Centurion, South Africa would have had 75 overs in which to score 191 runs; looks straighforward enough, as confirmed by the fact that they managed 301 in 85.5 overs in their real-life second innings. At Cape Town, the equation would have been 303 from 101; that looks a bit more challenging, but it's worth remembering that they got 447 in 111.2 overs in the second innings they actually played in that match. Okay, so this is artificial, and it entirely overlooks the effect that match dynamics and conditions had over the runs that were scored in the games as played. Naturally, I accept that, for a combination of these reasons, it is invariably harder to make a given score in the fourth innings of a match than it is to do so in the third. What this hypothetical scenario does show, however, is that – all other things being equal – the side that bats second has a double-faceted advantage over the the side that bats first: if they are in a winning position, they are more likely to be able to force a win, because they won't be delayed by the scoring of surplus runs, and, if they are in a losing position, they are more likely to salvage a draw, because they will have less time to bat out. In Durban and in Johannesburg, the gulf between the two sides was such that it's hard to imagine the toss, and the order in which the teams batted, having had any real influence on the outcome. Nevertheless, it's worth noting that, in both cases, the side that ultimately won the game lost the toss and was asked to field first. In both cases, the losing side's fate was sealed by a third-innings capitulation in the face of a daunting deficit after each side's first dig. Again, though, this is a match situation that is unique to teams taking first knock. Unless the gulf is so great that you're asked to follow-on (which has its compensations), this sort of intimidating prospect is never faced by the team that bats second. Even if you have conceded a first-innings deficit of hundreds of runs, it's still up to your opponents to bat again, taking time out of the match that may or may not prove necessary to their cause. By the time you do get to bat, you will have no more prospect of winning the game, but the draw might be a credible aspiration. When was the last time you saw a fielding side shut up shop and force a draw from a position in which, time constraints aside, they would surely lose? I can remember very few instances (this one leaps to mind with embarrassingly fresh rancour twenty years on), but the side batting fourth manages something like it all the time. And, if the side batting second is more likely to force a draw from a losing situation, the side batting first is less likely to win from a winning situation. Actually, in Johannesburg, had England batted for anything like the ten hours they managed in Cape Town, that would almost certainly have been enough, in conjunction with the frequent rainstorms that were knocking around, to have saved the test match. But the prospect of batting for a day and a half in an unwinnable match situation is, it seems clear to me, somewhat easier when there's only a day and a half left in the match. Instead, as their hosts had two tests before, England crumpled in the face of the task ahead of them (and, it has to be admitted, conditions were probably less conducive to rearguard heroics at the Wanderers). So what does this imply for the modern captain at the toss? As Charles Davis points out, captains who mistakenly choose to field first routinely get pilloried, whereas those who mistakenly choose to bat are seldom criticised, so you can't blame them for erring towards taking first dig. However, I'd say that the draws in Centurion and Cape Town absolutely vindicated Andrew Strauss's decision to send South Africa in; I haven't seen him get any credit for either decision and, according to the logic set out above, I reckon England would have lost if they had batted first (assuming, of course, that the games had followed an otherwise similar shape). Conversely, I'm not nearly so sure it was smart of him to elect to bat first in Johannesburg. I emphasised the all other things being equal, above, and it is only if this assumption (or something like it) holds true that we can automatically assume that the side batting second is at a significant advantage. Frequently, all other things will not be equal, and there will be good reasons to bat first – most notably, when you expect the pitch to deteriorate significantly as the match progresses. The fact that the advantage for sides batting second has developed over time may be seen as evidence that such pitches have become progressively rarer. In other words, the advantage of having the best of the conditions was, in the past, sufficient to outweigh the increased risk of running out of time in which to win. Clearly, though, that equation has reversed as time has gone on. The statistics and common sense strongly suggest that the modern captain should be looking for reasons not to field, rather than adopting bat-first as default. Obviously, conditions can make the captain's decision straightforward, one way or the other. But, in instances where he perceives no clear advantage to batting or fielding, I submit that a captain who is sensitive to the trends of modern cricket should have a bias towards sending the opposition in. In fact, if you look back at Figure 2, it seems that the last time WG Grace's famous exhortation to bat first under any circumstances really held true was... well, in WG Grace's day. UPDATE: David makes a couple of good points in the comments below. 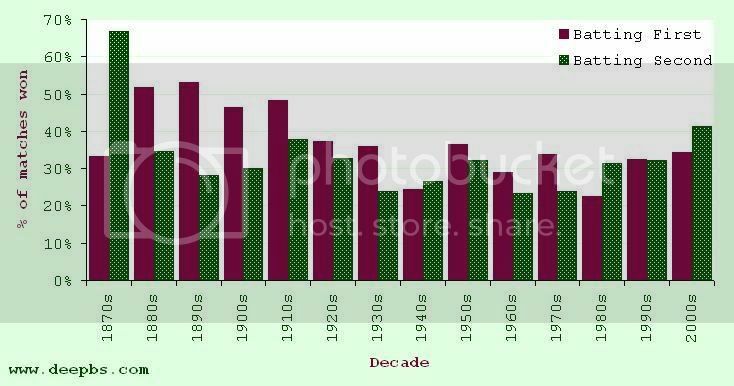 Firstly, as he says, if you discount matches involving Bangladesh from the test figures, the trend is diminished a bit – from a 15% advantage for teams batting second down to a 10% one since the beginning of 2000. If you discount Zimbabwe, too, it drops a couple of points further. In a way, though, this is kinda the point: batting second enables you to win the matches you should win more reliably (though, as David points out, the motivation, in extreme cases, may be just to get the match over and done with as swiftly as possible). His second suggestion is that the advantage for teams batting second should be greater in matches of shorter duration (because the disadvantage of batting first – i.e. running out of time in which to force a win in matches you're dominating – will be exaggerrated). This sounds plausible, and the evidence for it is suggestive if not compelling. 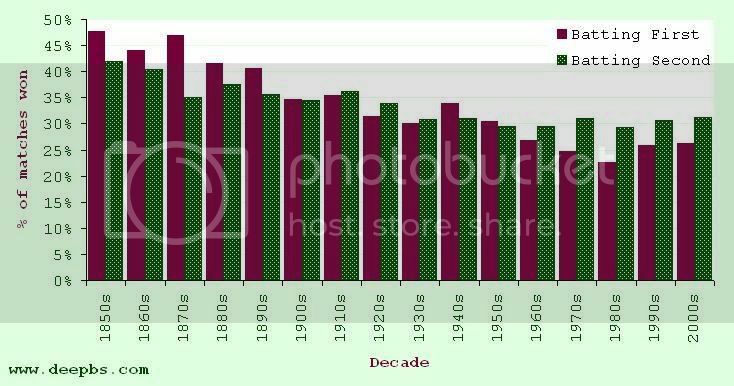 The new figure, below, shows how the advantage for teams batting second has developed over the last 160 years' FC cricket in 3-, 4-, and 5-day matches. 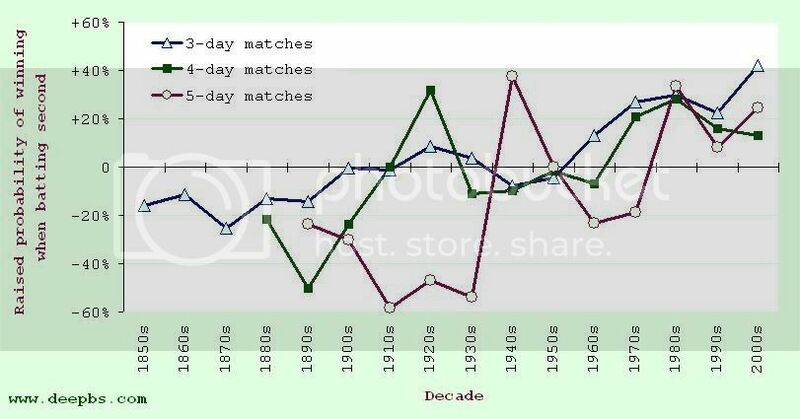 As expected, 3-day cricket has led the way, with a consistently rising trend over time, culminating in over 40% more 3-day games being won by the team batting second in the 2000s. Still, the longer games aren't far behind: since 1980, teams batting second have won more frequently than those batting first in all three lengths of the FC game. Though the benefit of batting second may be amplified in shorter games, there still seems to be an advantage on offer regardless of a match's duration. I would make two comments. The first is that that overall Test trend is exaggerated by captains fielding first against Bangladesh, presumably in order to get an extra day off (ie, they are aware that victories batting second take less time). The second is that you'd expect three- and four-day games to be more heavily in favour of the side batting second, because of the shorter timespan. Of course the batting is usually weaker at domestic level, which partly compensates. Ploughing your own furrow or making hay?